Part of the CURRENT:LA WATER public art biennial, Water Canning is a collective sculpture consisting of glass jars containing water from the region will set the stage for a water awareness workshop that includes instructions for creative tasks on the topic that participants can perform and upload to waterbodies.org. In collaboration with the Art|Sci Collective, Dr. Olivia Osborne will present her research on how silver nanoparticles in consumer products end up in water bodies/rivers affecting the aquatic environment. 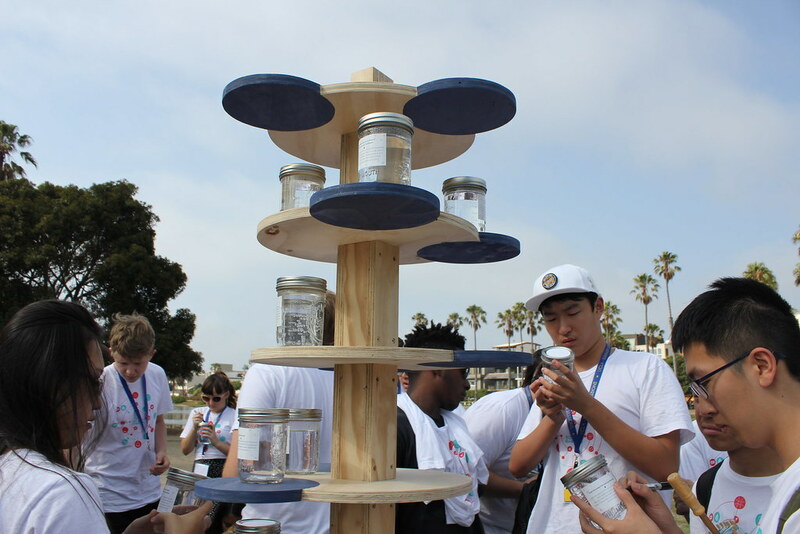 Glass jars for Water Canning will be provided during the two Art|Sci Collective × CURRENT:LA workshops on July 24th and August 7th, but everyone around the world is invited to participate and add their own special drop through this website! Treat the water from your jar preciously. Will you share a drink with a friend, water a plant, wash your hands slowly? Will you ration this water to do all of these things? Tell us how you choose to respectfully use this water. Take a picture of someone or something living that means a lot to you through your jar of water. Thank the water for making life possible. Add your drop and post your picture on waterbodies.org, and tell us about the picture and what it means to you. Make tea in your jar. Share it with a friend or simply enjoy it on your own, holding the tea up to the light and watching the particles of tea disperse into the water, making it golden. Think of the water needed to grow the tea and herbs, the molecular dance all through life that relies on the facile bonding in water. Share your tea ceremony & musings with us! If you see rain coming, place your jar outside to catch the rain. How much did you capture? Have you considered having water catchment on your own house? Photograph, share on social media and tag us #watercanning. Keep this jar of water in a special and visible place. Surround it with images and objects that are important to you around it. Think about the importance of water for the beginning of life and for maintaining life every day on this planet. Thank the water and try to add something nice to it every day. Place a flower or flowers in this jar of water. Put it in a place that enlivens life for you and others. Wash your hands or face and or the hands and face of someone else with this water. Pour it in small portions, appreciating each step: just enough water for wetting, scrubbing, and rinsing. Were you able to use it to wash your hands multiple times? How did the water feel? Lay down, put a drop of this water on your forehead. Or if in a group, place a drop of it on the foreheads of all members in your group. See if you can hold it there until it evaporates, or experience it as it moves across your skin. Describe your experience and post it waterbodies.org! Plant a seed/grow a plant. Use your jar to plant a seed (preferably a fruit bearing one)... What about planting an avocado? Place a handful of soil in the water. Observe the different layers of sand with different sizes and weight.After you are done observing, add more soil and potting soil, and plant a cutting from a succulent in your jar. Did you notice anything about the particle sizes? What about the particles you cannot see, such as nanoparticles, where do you think they are if they bond easily with water? Zoom in to see the details. Add your own personal water experiences.